We’ve talked to you about marketing automation several times on this blog, but we’ve never shown you what it actually looks like in practice. We’re making up for that today, by showing you a number of automations we’ve put in place over the past few months. 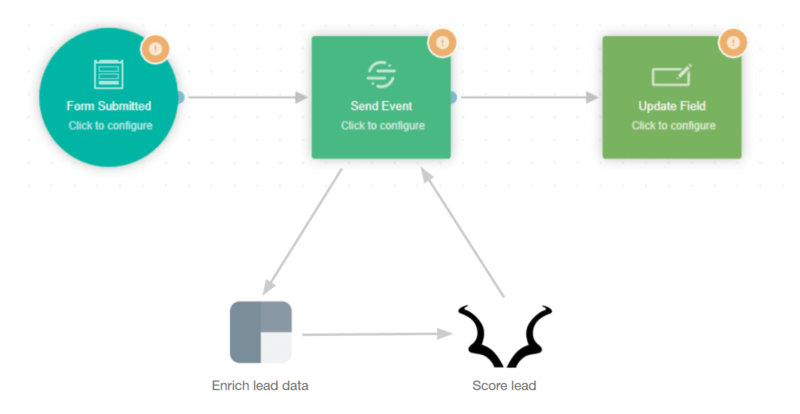 Take inspiration from these workflows to automate your own marketing, increase your level of efficiency and grow your revenue faster. Before diving into the nitty-gritty of it, let’s break down what automation actually is. At the most basic level, automation is made up of two main elements: a trigger and an action. The trigger is the primary condition that, if completed, will set the automation in motion. The action is the consequence of that trigger being set off. It’s also possible for a trigger to set off several actions in a single automation. Between the trigger and the action, different elements might be inserted to improve the outcome of the action. For example, a delay might be programmed in, so that the action isn’t triggered right away, or maybe a secondary condition is added to cause the automation to be split into two branches. Essentially, actions represent all the tasks you carry out on a daily basis in support of your marketing strategy. Tasks that are often repetitive and that, were they automated, would save a lot of time that you could then put towards activities that create more value. As for the triggers, the starting points for any automation, it is useful to break them down into three overarching groups: time-based triggers, action-based triggers and behavior-based triggers. Time-based automation are the simplest to set up, since the level of complexity involved in configuring the trigger is low. It therefore comes as no surprise that the majority of email marketing platforms offer this type of automation. If one of your contacts has a birthday, then a happy birthday email is sent. Requirement: the contact’s date of birth. If your contact has been a customer for a year, then a thank-you email is sent. Requirement: the date of the contact’s first purchase. If an email is sent on day one, then a second email is sent on day seven and a third email on day fourteen. Requirement: the functionality to build in time delays. Implementing automation based on a contact’s actions requires additional functionalities. This type of automation is offered by most marketing automation platforms, because they don’t present any particular difficulty other than good integration abilities. 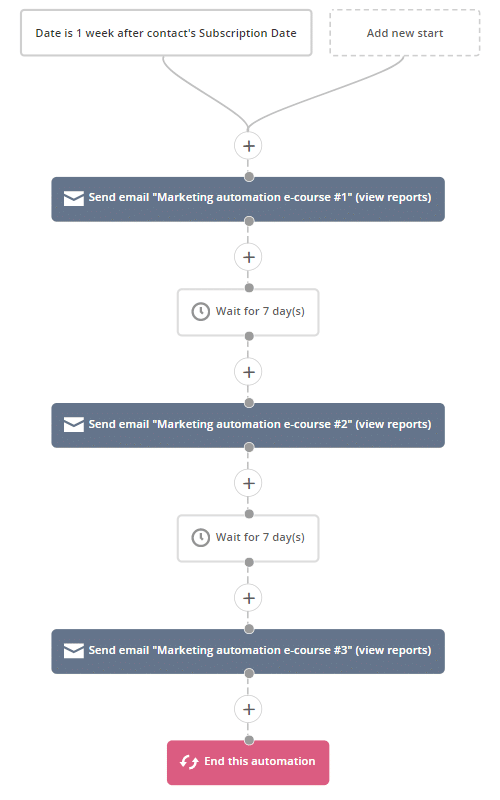 This type of automation is even starting to show up in certain email marketing platforms (MailChimp, CampaignMonitor, etc. ), a sign that they are steadily becoming more and more commonplace. Here, triggers might include: form submissions, page visits, interaction with an email, adding an item to a shopping cart, a manual status change, etc. If a contact adds a product to his/her shopping cart but doesn’t complete his/her order (abandons their cart), then a reminder email is sent. Requirement: integration with an e-commerce platform. Also works for a product the customer has looked at but not added to his/her cart. If a contact signs up for your webinar, then he/she is added to your list of registered participants in GoToWebinar and will receive a registration confirmation email (as well as registration reminders as the webinar approaches). Requirement: ability to capture the webinar registration (via a form or registration) and integration with GoToWebinar. If an opportunity is marked “lost” in the CRM by a rep, then a series of nurturing emails is sent to the lead to try to convert him/her later. Requirement: have a CRM layer in your platform or integration with your CRM (or lead management tools). If a contact registers for your newsletter, then he/she automatically receives a welcome email. This email could include a welcome message (reminding the user of your USP and the added value of the newsletter…), registration details (e.g., send frequency), and a selection of popular blog posts so the user can start reading right away. Requirement: ability to capture newsletter registrations (via a form or integration). If a lead becomes a customer, then he/she receives a series of on-boarding emails to present your product’s full range of functionalities, therefore increasing the chances that he/she actually uses it. Requirement: have a CRM layer in your platform or integration with the CRM (or lead management tools). If a project finishes, then a satisfaction survey is sent to the client. Requirement: integration with your project management tool. If a contact hasn’t opened your newsletter in over six months, then an email is sent asking him/her to confirm whether he/she wants to continue receiving your emails. Requirement: ability to monitor email opens. If no confirmation within 30 days, his/her email is removed from the list. If an inactive customer reacts positively to a reactivation email (see the example below), then a customer support email is automatically sent, offering to help the customer use the product (a coaching call, for example). This also works for lead nurturing: if an inactive lead reacts positively to activation, a sales email is automatically sent. If a lead visits a key page of your website (e.g., “Pricing”), then an email is sent to your sales team. Requirement: ability to monitor website visits. Automations based on a contact’s behavior go far beyond automations based on actions because the trigger here is now a series of actions or non-actions. Collecting these actions requires the ability to integrate with all the different tools where these actions might be taken, as well as the ability to manage the actions, associated with a particular contact. This is where “contact management”, one of the three main pillars of a marketing automation platform, comes into its own. As a reminder, the three pillars of a marketing automation platform are: a centralized contact database, a marketing engine that allows you to create content and automate processes, and a complete measurement and analytics tool. Triggers might include: a change in the value of a personalized field, receipt of an event from an external tool, the addition of a tag associated with a contact, etc. If a contact opens a promotional email but the offer doesn’t convert them, then he/she is added to a Facebook remarketing list. Requirement: ability to monitor visits (and conversions) on the conversion page (via a tracking pixel) and Facebook integration. If a contact looks at several articles on a particular subject on your site, then it is sent a series of emails on that subject (complementary articles, relevant pieces of content, etc.). Requirement: ability to monitor website visits and tag contacts based on their behavior on the site. If a contact interacts with your campaigns or website within the last 30 days, then he/she is identified as “engaged”. If a contact hasn’t interacted with your campaigns or website within the last 30 days, then he/she is identified as “unengaged”. And if he/she hasn’t interacted with you in the last 60 days, he/she is identified as “inactive”. Requirement: ability to monitor interactions with campaigns and website and be able to add tags to contacts based on the data collected. If a customer becomes “inactive”, then he/she receives an email with the latest news, inviting him to take another look at your product/service. Requirement: ability to monitor website logins. If a customer is identified as “happy” (for example, he/she responded with 7+ to the last NPS survey), then he/she receives an email with an exclusive offer (e.g., a rebate on their membership renewal), encouraging him/her to publish a recommendation of the product/service on a dedicated site. Requirement: integration with your survey deployment tool, ability to monitor responses, and the ability to add tags to contacts based on their behavior. This also works if the customer is identified as “unhappy” (e.g., NPS <7); in that case a series of re-engagement emails is sent to win back the customer’s satisfaction (e.g., tutorials, case studies, coaching sessions, etc.—depending on the reason for the dissatisfaction). If a customer refers a contact who then becomes a customer himself/herself, then a rebate of 25% is applied to his/her next bills. Requirement: a layer in your CRM that’s able to link different contacts and a connection with your ERP or billing tool to apply the rebate. If a lead is identified as “hot”, then a rep is assigned to him/her and a notification is sent to that rep so he/she can contact the lead as soon as possible. Requirement: ability to monitor a contact’s behavior across their buyer journey, and a scoring system. If a new lead is collected, then his/her data is automatically pushed to data enrichment and predictive scoring platforms to know instantly whether this contact represents a potential sale. Requirement: integration with these tools. Automation based on contact behavior are at the base of modern relationship marketing. This is what allows you to build and maintain a direct conversation with a contact, by personalizing messages depending on the context — in other words, by sending the right message at the right time, through the right channel, rather than sending the same message to a multitude of different people. Finally, the more automated marketing becomes, the more personalized it becomes for the contact with whom you have a relationship.